This evening, the Boston Red Sox and the Los Angeles Dodgers will square off in the first game of the World Series. As a longtime Red Sox fan, I am excited that my boys have the chance to win the franchise’s fourth championship since their curse-ending victory in 2004. As a baseball fan in general, however, I am especially excited that these two storied franchises are competing for baseball’s highest honor. Both teams have long histories: the Dodgers played their first game in Brooklyn in 1883, just seven years after the National League was established; the Red Sox were founding members of the American League in 1901. Despite their shared longevity, each of these teams represents a distinct perspective on the game. Indeed, one could argue that the Dodgers and the Red Sox represent two competing baseball philosophies. Though an older franchise, the Dodgers have long been innovators. When they moved from Ebbets Field to Dodgers Stadium, they became the first team to play on the West Coast. When they put Jackie Robinson at first base in 1947, they became the first Major League team to integrate their roster. The Red Sox, on the other hand, are among baseball’s most flamboyant traditionalists. They have played at Fenway since the Taft Administration, squeezing uncomfortable seats into every available corner of the ballpark. While Dodgers fans can proudly claim that their team helped break baseball’s color barrier, devotees of the Red Sox must reckon with the shame of knowing that Boston was the very last team to field non-white players, owing to the intransigence of Tom Yawkey, the club’s reactionary and recalcitrant owner. Lest we think that these differences are purely historical, they seem to play out on the field as well. During the 2018 postseason, the Dodgers have played 2018 baseball: eschewing “small ball” tactics in favor of leveraging high-percentage matchups. Meanwhile, the Red Sox seem to have lost their sabermetrics memo; they spent the league championship series simply putting the ball in play and trying to get guys on base. This evening, in other words, we will see a fascinating clash between two distinct baseball philosophies, between those who look to the future and those who look to the past. This tension tells us something about ourselves. There is a part of each of us that looks to the horizon with a sense of hope about who we might yet become. There is also a part of each of us that looks wistfully to where we have come from, knowing that we can’t go back, but trusting that we will not forget who we have been. In baseball, there is room for innovation and tradition. In fact, baseball invites us to acknowledge that neither approach is complete: one cannot look forward without also knowing where one has come from; one cannot look back without recognizing that time continually marches on. Tonight we will witness more than two teams playing a game; we will witness a meditation on the ambivalence of knowing that our lives are shaped by who we have been and who we will be. The Super Bowl was played a few days ago. While the play on the field was certainly thrilling to watch (though perhaps not for Atlanta Falcons fans), the most memorable moment for me occurred prior to kickoff. Just before the National Anthem, Phillipa Soo, Renée Elise Goldsberry, and Jasmine Cephas Jones (the Schuyler Sisters from the original Broadway cast of Hamilton) sang “America the Beautiful.” To put it mildly, their performance was spectacular. Like latter day Andrews sisters, their close harmonies reflected their obvious chemistry, and their creative arrangement breathed new life into Katharine Lee Bates’ powerful poem. Much has been made of the fact that Soo, Goldsberry, and Jones made the lyrics more gender inclusive. Though this was laudable and worthy of notice, I was even more compelled by a reaction from the sidelines. Right after Goldsberry and Jones sang “sisterhood,” the camera cut to Dan Quinn, the head coach of the Falcons. He was grinning broadly, clearly delighted by what he was hearing. When he noticed that he was on the Jumbotron, he quickly composed himself and assumed a “tough football coach” scowl. For a fleeting moment, however, Dan Quinn could not contain his delight. Delight is a word that has fallen out of fashion over the years. In part, this is because it became a mere synonym for “happiness.” Delight, however, is about much more than mere pleasure. The psalms suggest that those who are righteous “delight in the law of the Lord.” Though one does not generally think of a law as something to take delight in, it is important to remember what the law represents to the psalmist. The Law was the symbol of God’s claim on Israel, the reminder of God’s persistent faithfulness. Taking delight in the Law involves recalling the fullness of our relationship with God, recognizing that God’s love endures all circumstances. Those who truly appreciate the nature of this relationship cannot contain their delight. There is a discipline to delight. Delight requires conscious recollection, a willingness to look past our current frustrations and see the potential for good wherever we go. We live in serious times. Some might argue that delight is a luxury we cannot afford. But delight is not incompatible with seriousness. In fact, the only way we can be serious about the tasks before us is if we take delight in them. In this time of outrage, frustration, and anxiety, I pray that we will take time to be delighted, remembering that we are defined not by our present circumstances, but by the love of God. To watch video excerpts of a forum presentation of this topic, please click here. As he made his way from Mount Vernon to the temporary capital of New York, Washington was greeted as a conquering hero at community along the route. For his part, Washington was deeply concerned about the expectations of his people. “I greatly apprehend that my countrymen will expect too much from me,” he wrote anxiously. “I fear if the issue of public measures should not correspond with their sanguine expectations, they will turn the extravagant praises which they are heaping upon me at this moment into equally extravagant censures.” Washington, in other words, recognized that no human being could possibly be everything that the American people hoped for. Nevertheless, the American people were so eager to locate their hopes in one person that they seemed willing to jeopardize their grand experiment in self-government. The old prophet’s point is clear: his people have no idea what they are asking for by demanding a king. Though Samuel alerts his people about the perils of monarchy, the people of Israel are adamant: “No! but we are determined to have a king over us, so that we also may be like other nations, and that our king may govern us and go out before us and fight our battles.” Their logic is almost paradoxical: Israel not only wants a king to save them from their enemies; they also want a king so that they will be like their enemies. Israel’s desire for a king is much more than a political preference; it is the ultimate act of idolatry. The LORD says as much when Samuel prays in frustration: “Listen to the voice of the people in all that they say to you; for they have not rejected you, but they have rejected me from being king over them.” Israel would rather put their lives in the hands of a human being than trust in the God who redeemed them from slavery. Israel’s desire for a king signals a fundamental change in its identity: from those who have been chosen by God to those who choose a God for themselves. Their determination to have a king, in other words, led them to forget who they were. This is an unusual election season: not just because of the bombastic rhetoric, not just because one of the candidates is a former First Lady, and not just because the other party’s nominee is a political neophyte. This election cycle is unusual because many people have invested all their hopes in their chosen candidate. Though this is always the case to some extent, 2016 has charted new territory. We have moved from “Which candidate would you like to have a beer with?” to “Which candidate will you trust with your very sense of self?” Indeed, not since the early days of the republic has the line between electing a chief executive and anointing a monarch been so faint. Whereas George Washington was exceedingly apprehensive about his countrymen’s desire for a king, both campaigns have been pretty cavalier about it this year. Of course, the Republican nominee has enthusiastically embraced this desire, announcing that he alone could solve the challenges facing our nation and declaring, “I am your voice!” Though the Democratic candidate has been more circumspect in this regard, the fact is that her entire campaign has hinged on the idea that she is the only viable option. For many, including the candidates themselves, the people running in this presidential elections have become the agents who will rescue us from despair and uncertainty. We have been so eager to put our trust in these presidential candidates that we are at risk of forgetting who we are. This raises important questions for us as people of faith. The Christian faith teaches that we cannot ultimately locate our hope in any human being. What happens when, in our eagerness to support our chosen candidate, we fail to remember that God is the sole source of our life and salvation? Moreover, how can we faithfully engage the political process in this season when we seem to be collectively forgetting the words of the psalmist: “Do not put your trust in princes, in mortals, in whom there is no help”? If we are to faithfully engage the political process, I believe there are three primary tasks before us: discernment, empathy, and prayer. Choose one of the major party nominees on their merits. Choose one of the major party nominees on the basis of the other nominee’s faults. Choose a third-party nominee or write in a candidate. All of these are principled choices if they are the result of faithful discernment. I would, however, like to offer a few words of caution. If you choose to vote for a third party candidate, take care that your argument does not boil down to “the lesser of two evils is still evil.” Though it’s hard to argue with that logic, it’s also important to remember this fundamental assumption of the Christian faith: “All have sinned and fall short of the glory of God.” To put it bluntly: every one of us is evil. There is no morally pure choice in any situation, particularly when human beings are involved. Furthermore, keep in mind that sitting out this election does not liberate us from the decision-making process. Unless we are ineligible to vote, we are participating even if we stay home on election day. In other words, while not choosing may very well be the principled path in this election season, it is still a choice. Finally, I would warn against what one might call the “Don’t blame me, I’m from Massachusetts” phenomenon. This refers to the bumper sticker that was popular around 1975, when Richard Nixon resigned the presidency after receiving the electoral votes of every state except Massachusetts in the previous election. Those who had this sticker on the back of their cars were making an obvious point: we bear no responsibility for the current state of our nation. Nevertheless, one of the consistent themes in the New Testament is that we are both responsible and accountable to one another. We function in community; we do not have the option of existing in isolation. There is another important aspect of discernment. This has been an election of clickbait headlines and sensational stories. As Christians, one of our primary responsibilities is to decide what is truly worth our attention. Be cautious about where you get your information, and take care not to get swept up in the sensationalism that has driven so much of the coverage of this election. When we wake up on November 9, the election will be over and we will have to find a way to live peaceably with one another. It’s important for us not to assume that everyone who makes a different choice for President is stupid or wrongheaded. We all have reasons for discerning the option we have chosen. With that in mind, I want to commend to you an “exercise in political empathy.” At the end of July, Scott Gunn, the director of Forward Movement, posted the following on Facebook: “Please try to list one positive reason why someone might vote for the presidential candidate you do NOT support.” Give this a try. Write down your reason. The point is not to change your mind, but to recognize that we all see the world differently. It is easier to be empathetic to all of the candidates and their supporters when we pray for them. In 1 Timothy, the author urges “that supplications, prayers, intercessions, and thanksgivings be made for everyone, for kings and all who are in high positions, so that we may lead a quiet and peaceable life in all godliness and dignity. This is right and is acceptable in the sight of God our Savior, who desires everyone to be saved and to come to the knowledge of the truth.” Pray for the candidates by name. It is one of the ways that we remember that those who have stood for election this year are, like you and me, ultimately dependent on God for their life and salvation. More importantly, prayer is the way we acknowledge God as a true reality. It allows us to recognize that our salvation does not depend on a presidential candidate or any other human being. In the end, prayer allows us to recognize that God is our king. Acknowledging that God is our king empowers us to entrust our lives and the life of the world not to a human being, but to the God who created and redeemed us. Newcomers to this country are often surprised by how frequently Americans ask each other, “How are you?” In most other countries, such inquiries would be considered an invasion of privacy, or at the very least irrelevant to the conversation. Of course, newcomers are even more surprised to learn that this query is largely perfunctory. Indeed, there is only one “correct” response to this question. No matter what is happening in our lives, there is a collective cultural expectation that we will respond, “Fine” when someone asks us how we are. We are instructed and encouraged in this behavior from an early age. Even my 21 month old somehow knows to say “Good” when I ask her how she slept. While it may seem that there is nothing wrong with this, there is something troubling about this tendency. Our collective assumption that the only thing to say is “fine” when someone asks us how we are eventually convinces us that the only way to be is “fine.” When we force ourselves to be “fine,” we lose something elemental about the human experience. What we lose is the opportunity to grieve. Sometimes being “fine” is not an option; sometimes, when we are faced with loss and uncertainty, grief is the only appropriate response. Yet, when we assume that “fine” is our baseline, grief becomes abnormal, something we need to dispense with as efficiently as possible. We end up thinking of grief as a process, something we can “do the right way.” We cannot, however, approach grief as a problem to be solved; it is something we must experience as a fundamental aspect of who we are. Indeed, grief is a centrally important part of our lives because loss is central to our lives. Part of mystery of being human is that we have the capacity to love even what we know we will lose. Grief permits us to recognize this paradox, because it allows us to trust that even what we have lost belongs to God. The ability to grieve is part crucial component of the Christian life. The Book of Common Prayer, for instance, notes that rite for the Burial of the Dead “finds all meaning in the resurrection,” which is God’s pledge that nothing can separate us from the love of God in Christ Jesus. At the same time, the prayer book notes that human grief is not unchristian: that the deep sorrow we experience when we lose someone is animated by the love we have for one another in Christ. There are times when we are not “fine.” There are times that we experience that deep pain of loss that is a fundamental part of the human experience. It is in these times that we need to summon the grace to grieve, to admit that we are not fine, and to trust that even what we have lost belongs to God. Lent Madness is the brainchild of an Episcopal priest who noticed that the Christian season of penitence and renewal usually coincides with the NCAA Basketball Tournament (known colloquially as “March Madness”). Seeing an opportunity to educate people about the Christian faith, this creative cleric applied March Madness’ tournament bracket to the lives of the saints. The idea behind Lent Madness is pretty straightforward: 32 saints go head to head in a single elimination tournament bracket in which people vote for their favorite saint. The tournament continues (through the “Saintly Sixteen,” “Elate Eight,” and “Faithful Four”) until two remain to compete for the “Golden Halo.” It’s good fun, and is a wonderful way to learn about the lives of the saints: those who lived their lives knowing that they had been transformed by the grace of God. There is no way to peace along the way of safety. For peace must be dared, it is itself the great venture and can never be safe. Peace is the opposite of security… Peace means giving oneself completely to God’s commandment, wanting no security, but in faith and obedience laying the destiny of the nations in the hand of Almighty God. Though it was an accident of voting, the fact that these two saints are competing for the Golden Halo is almost providentially appropriate for our world today. Every day, we hear of violence throughout the world: from Brussels to Anakara to Yemen to Istanbul to Baghdad. Every day, we hear of people risking their lives to seek refuge from terrorism, only to be turned away because of fear and prejudice. Every day, we hear political rhetoric that is an affront to human decency. The fabric of our humanity seems to be fraying. In the midst of this tumult, the clarion voices of Dietrich Boenhoffer and Julian of Norwich call out in the words of the psalmist: “Put your trust in God.” During Holy Week, we remember that God experienced the absolute depths of human frailty and sin, that God witnessed us renounce our very humanity. At the same time, we also affirm that God redeemed even our inhumanity. The cross reveals a fundamental truth that animated the lives of both Dietrich Boenhoffer and Julian of Norwich: even when everything appears to have fallen apart, everything still belongs to God. I am a baseball fan. I love almost everything about the game: the way that it puts me in touch with my childhood, the way that it juxtaposes the urban and the pastoral, the way that it creates its own sense of time in an overly-scheduled world. I find, however that the most compelling thing about baseball is the way that it lends itself to story and narrative. The great Bart Giamatti, baseball’s resident philosopher during his brief tenure as its commissioner, noted that the game can be divided into three acts (3 x 3 innings) that enact a fundamental human drama: the journey of life that takes us through perils and challenges as we strive to make our way home. Unlike the dramas of stage and screen, baseball encourages and requires the participation of the audience. Those assembled in the stands of the ballpark function much like a Greek chorus, punctuating and narrating the events unfolding before them with cheers, jeers, groans, and applause. The practiced ear can tell what is happening on the diamond just by listening to the sounds of the crowd: from the steady escalation of enthusiasm as a double play is turned to the collective sigh of disappointment as a 3-2 count results in a walk to the unbridled ecstasy of a well-hit home run ball. The sounds of baseball are crucial because they remind us that the game is not played in a vacuum, that it is meant to be a shared experience. The sounds of baseball testify to the fact that the story baseball enacts is our story, the story of a people trying to find their way home. Yesterday, baseball was robbed of its power to tell this story. 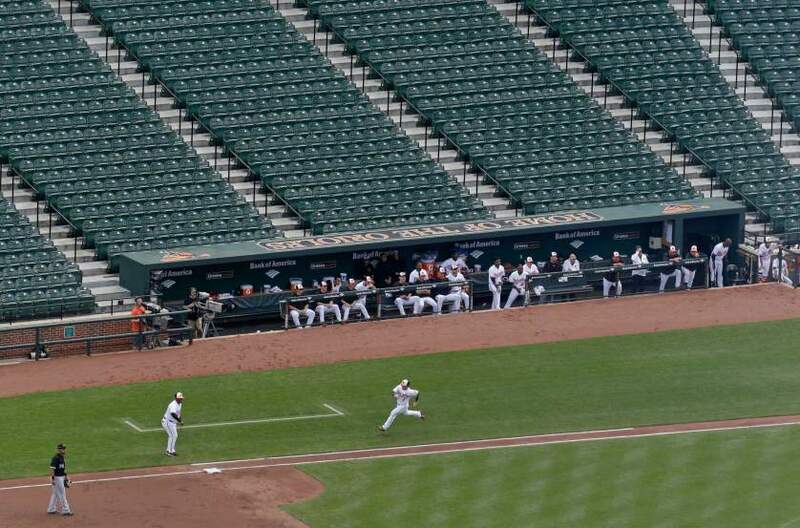 As a result of the recent unrest in Baltimore, the Orioles played the Chicago White Sox in an empty stadium. This game marked the first game that two teams have played without an audience of any kind. Naturally, it was a strange experience. Though the players pitched, fielded, and hit as usual, they gave the appearance that they had lost their reason for playing. At first, I thought that closing Camden Yards to the public yesterday was a mistake, a missed opportunity. After all, sports have the almost unique ability to bring people together after terrible tragedies. The first Red Sox game after the Boston Marathon bombing, for instance, was a cathartic and unifying experience for the people of that beleaguered city. Surely, an Orioles win at Camden Yards would have galvanized the people of Baltimore and helped them to move beyond the events of the past several days. As I thought about it more, however, I realized that it is not time for the people of Baltimore or any of us to move beyond the events of the last week. In our culture, our first instinct is to paper over our grief and pretend that our pain has gone away. When we do this, however, we fail to allow our grief to be transformed and to transform us. The crowdless game at Camden Yards may have been painfully necessary because it exposed the depth of Baltimore’s grief. As I watched yesterday’s game, I had an unavoidable and overwhelming sense of emptiness. I think that it is important for us to feel that emptiness. It is important for us to recognize that there are people in this country who have felt that emptiness for too long. The empty silence at Camden Yards was important to experience because it gave an opportunity for lament: lament for Freddie Gray, lament for injustice, lament for victims of violence everywhere. Lament is an important and misunderstood part of the Christian experience. Perhaps the most well-known lament from Scripture is Psalm 22, which begins with the plaintive question: “My God, My God, why have you forsaken me?” It is the psalm that Jesus quotes from the cross in the gospels according to Matthew and Mark. It is a psalm that explores feelings of abandonment, loss, and emptiness. At the same time, it is about far more than the psalmist’s pain; it is a psalm that affirms the faithfulness of God. After the psalmist has recited all of the ways that he has felt abandoned, he writes, “I will tell of your name to my brothers and sisters; in the midst of the congregation I will praise you.” In Scripture, lament is not about despair, it is about acknowledging our grief before the One whose faithfulness is beyond our capacity to imagine. As we lament for Baltimore and for all victims of injustice, we are called to trust that God will transform our grief into hope. Moreover, we are called to use that hope to empower the leaders of our communities recognize that we are all part of the same story. There was one sound at yesterday’s game that was new to even the most experienced baseball fan. Though the stadium was closed to the public, a small group of Orioles faithful gathered outside of the stadium to cheer on their team from afar. Towards the end of the game, the faint chant of “Let’s Go Os” grew more and more distinct. In the silence of grief and lament, this chant was a still, small voice of hope, a small token of our shared story, a reminder that we are called to find our way home together. Last week, the Church of the Redeemer was closed for a snow day. Notwithstanding the limited accumulation (some clever souls dubbed the storm “The Fizzard of 2015”), there was something delightfully nostalgic about being “snowed in.” The instant I discovered that our offices were closed, I was transported back to my childhood, to those wonderful moments when I looked out the window at a world blanketed in white and knew that the day was full of unanticipated possibility. Of course, snow days can be slightly more complicated for adults. They oblige us to reschedule meetings, ensure that our children are occupied, and deal with the anxiety of missing a day of work. 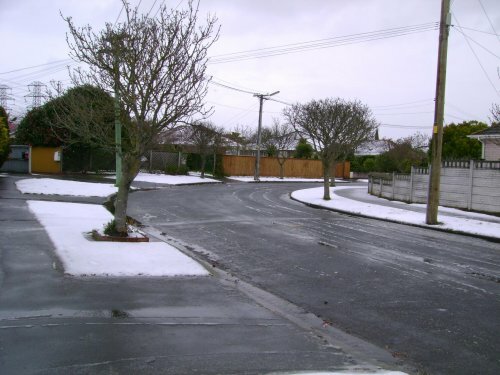 In spite of these these complications, we ought to view snow days with at least some of our childhood delight. Snow days are unique opportunities to experience a true respite from our impossibly busy schedules. We tend to fill other days off with chores and other obligations. Since snow days are unanticipated, however, they are unencumbered by plans and expectations; they are opportunities to do things that we would otherwise not have time to do. Snow days are a gift, and the appropriate response to a gift is gratitude. Gifts often make us a little uncomfortable. When we are given a gift, we tend to assume that we either do not deserve whatever we have received or that it was given out of a sense of obligation. As Christians, however, we are called look at gifts in a different way. Our faith affirms that God gives us the gift of his grace freely and without condition. We are not meant to discern the reason God’s grace has been made known to us. Rather, we are called to respond to this grace by gratefully acknowledging that our lives have been changed through what God has done for us in Jesus Christ. One of the ways we exercise this gratitude is through the practice of Sabbath. Sabbath is an opportunity to remember that we are called to put our trust in the God who created and redeemed us. Sabbath is a way of pausing in the midst of our busy schedules so that we can move from a place of anxiety to a place of peace. Like a snow day, Sabbath is meant to be a gift, a chance to give thanks for the grace that God has so freely given us.